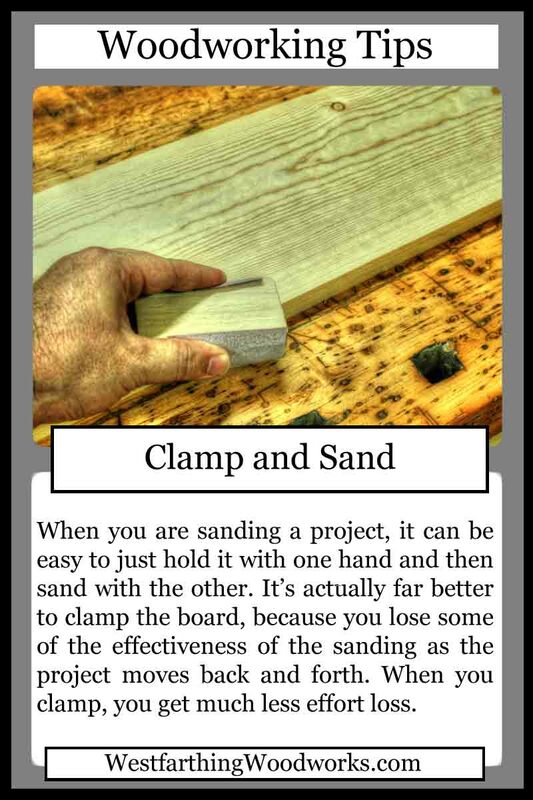 This woodworking tips card is called Clamp and Sand. When you are sanding, it can feel like a lifetime passing by before the project is ready. One way that you can ensure all of your efforts are going into the piece is by clamping it while you sand. Here is how. Sanding is a chore sometimes. We spend all this time working on a piece, and then sit there and polish it by hand with paper until it is finally smooth enough to finish. This happens really close to the end of the project, and can be one of those times when it’s hard to resist the urge to rush. 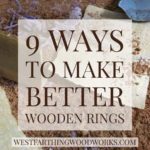 A well sanded piece of woodworking takes a finish really well, so it’s not a good time to hurry the process along. 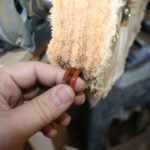 One thing that you can do in order to get the most out of your sanding is to clamp your piece to the bench when you sand. It is normal for woodworkers to just hold the piece with one hand and sand with the other. 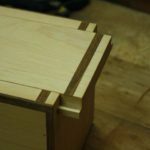 This is about the only way that you can do it for smaller pieces, but with larger items you can clamp them. Every time you sand, you lose a little energy from the piece moving as you are trying to hold it down. 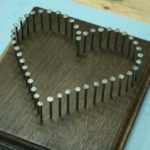 This is effort lost, because you are only getting a certain percentage of your energy actually being transferred to the piece of wood being sanded. For the most possible efficiency, clamp your piece to the bench whenever possible. Sand with the piece locked in place, and you will get far more of the sanding effort to transfer to the surface than by hand holding. You can also use vises, or other means of holding the piece, which will accomplish the same thing. You get another bonus from clamping too, and that is you are now free to use both hands for the sanding process. Having both hands free means that you can switch from hand to hand as needed. When one arm gets tired, just switch to the other one. Repeat this back and forth and you will feel far better as you sand your project smooth. There is an old Abraham Lincoln quote where he talks about taking several hours to sharpen his ax before cutting down a tree. The essence is that without the effort made in the setup, the project takes a lot longer than it should. 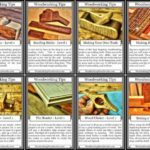 The time you spend in setup and preparation returns itself several times in the end as the task moves along really quickly. The time you spend getting the task ready before starting will always reward you in the end with less hassle and more efficiency. 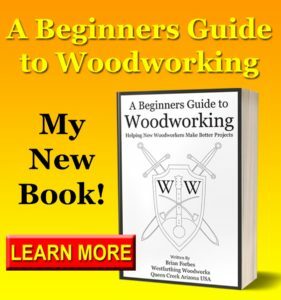 This principle can be applied to just about anything, including woodworking. As you get your project ready, the more you can do on the front end, (sharp tools, well made jigs, a clean shop, easy to find tools), the easier the project will flow on the back end. 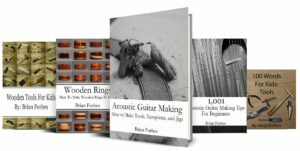 Some woodworkers think it’s a hassle to stop. This is not a good thing. 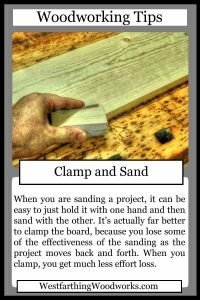 It only takes a few seconds to clamp a board to the bench before you sand it. Once you see the efficiency difference, you will realize that you get those few seconds back nearly instantly. The difference in the amount of force that is transferred to the board when you are sanding a clamped piece versus a held piece is quite a bit. You can actually feel it when you work, and you instantly know you are making a difference. If you do not have time to prepare, then you do not have time to do the project. It’s the difference between doing it right and doing it twice. When you take the few seconds to clamp down your piece before you sand, you give yourself the most efficiency and the most energy transfer to your piece.